Nestle has issued a product recall on some of their pizza varieties! This is a precautionary measure and a voluntary recall on one batch code of Delissio Pizzeria Vintage Tuscan Style Chicken pizza and one batch code of Delissio Thin Crispy Crust Grilled Chicken Tomato & Spinach pizza. This recall does not affect any other Delissio products in Canada. The voluntary recall is due to the potential that affected batch codes of the two pizzas may contain small pieces of glass. 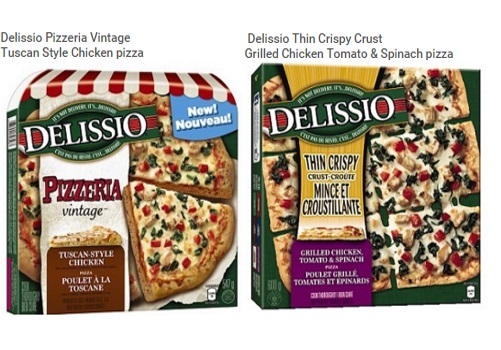 Consumers who have Delissio Pizzeria Vintage Tuscan Style Chicken and Delissio Thin Crispy Crust Grilled Chicken Tomato & Spinach pizzas with the affected batch codes should contact Consumer Services for reimbursement at 1-855-395-1238 and then dispose of the product.